I didn’t placed a question mark in the title’s queue because the post is not only about clearly tracing the reasons of a Symbian failure in North America but more about a quick analysis (without giving some numbers or percents, if this can be possible) of the american mobile market. In fact I do not know whether to trust this one or another statistic, they all differ depending on who requested them, but one thing is sure: Symbian is far from top 3 of most deployed OS on smartphones. 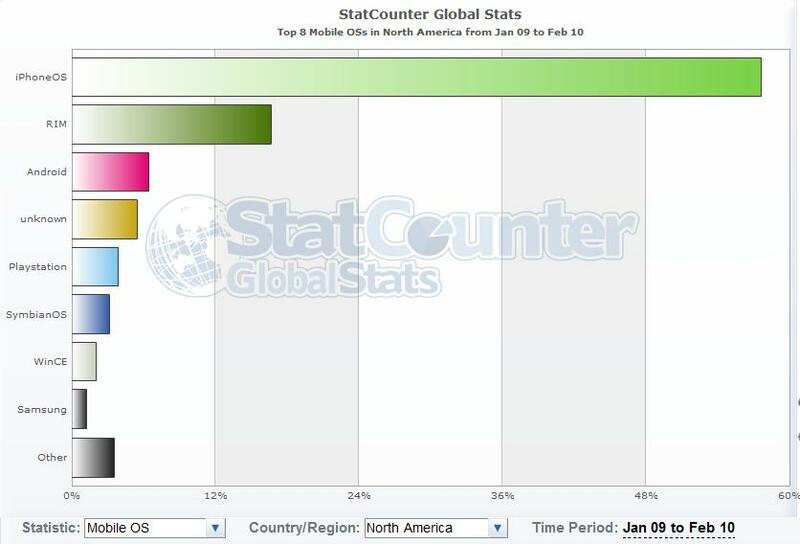 This statistic was taken from here, but I found many other which are awarding RIM’s Blackberry as the most deployed mobile OS in US. Let’s briefly go through the possible reasons that may prevent Symbian to reach top 3 in United States. First of all one question should pop-up in our minds before any further comments: who is responsible for the succes of one mobile OS or another? There are two decisive factors: mobile carrier providers and device manufacturers. Here some things need to be clarified, as I already mentioned in my previous posts about Symbian, this is used by the following device manufacturers, nokia, sony-ericsson, samsung and LG, second thing is that top three mobile carrier providers are Verizon, AT&T and Sprint Nextel(in this order). As you all may know in North America it is largely spread CDMA mobile standard instead of GSM, which rules in the rest of the world. One big drawback that Nokia didn’t manage to take care is that their smartphones, on which Symbian resides, are not enabled for CDMA networks that prevail in United States and more than this, they are not enabled for 850 and 1900 GSM bands available in US and which are not used in Europeand Asia. So, probably from a global perspective it was quite complicated for Nokia to manucature two cell phones, one for GSM standard and one for CDMA.